The generation of Intellectual Properties (IPs) which include patents, trademarks, designs, and copyrights stand at the forefront of the activities that place a University on world-class relevance. All concerned stakeholders, especially, the researchers and inventors stand to gain immensely from IP generation and commercialization. Such benefits range from financial proceeds from their IPs to Industrial linkages and royalties. 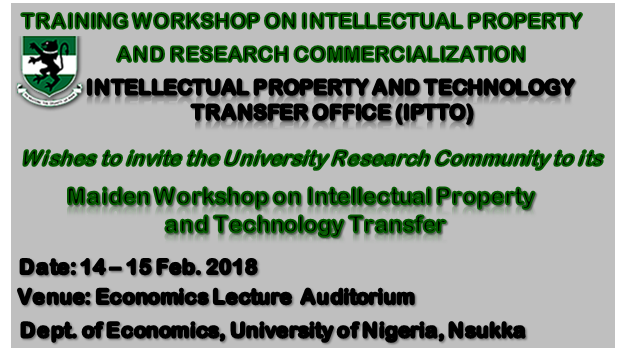 The Vice Chancellor hereby hosts the Intellectual Property and Research Commercialization workshop to afford all participants the opportunity to grasp fully the concept of IP generation in the University setting, the processes involved in research output commercialization, as well as hands-on training on the patenting process. Click to DOWNLOAD more INFO….